A 6 seater garden table is a popular choice for the average household. It’s enough to seat the family, and possibly a couple of guests, but doesn’t take up too much space. If you’re serious about having a high quality 6 seater garden furniture set for your garden or patio, take a look through our range. We have a great selection of metal garden tables in different shapes, styles, sizes and colours. Cast aluminium garden furniture is our specialty. This material is lightweight, robust and perhaps most importantly, weather resistant. A light piece of garden furniture is always a big bonus, allowing you to move it around without breaking your back. Lightness could give the impression that our garden furniture is more delicate. This is not the case. Cast aluminium is plenty tough and our 6 seater patio sets certainly won’t bend or snap with normal usage. Surviving the weather is no problem, either. If you like the look of metal garden furniture and tried out cast iron pieces, you’ll know that not only are they heavy, but rust-prone too. Preventing iron or steel garden furniture from rusting requires oiling and at times covering the furniture. Similarly, wooden furniture requires sanding and coating with weatherproof paint to keep it in good condition. Cast aluminium garden furniture requires no such maintenance. Keep it outside all year round and without, sanding, painting, oiling or covering it will survive without difficulty. When it comes to cleaning your aluminium garden furniture, all you need is to wipe it over with a damp cloth dipped in some soapy water. So if you’re looking for maintenance free garden furniture, look no further. The June table is an oval garden table measuring 150cm by 95cm. It features a lattice design on the table top with a double-helix patterned border. The June table can fit a parasol if desired, and weighs just 19kg. If you like the look of the oval shaped June table, you can head over to our category page to browse all our oval 6 seater tables. We also have the Frances table, a round garden table that comes with a Lazy Susan turntable. This elegant table measures 150cm in diameter, and comes in Antique Bronze, white, and Slate Grey. The Sophia table is one of our rectangular 6 seater aluminium garden tables that comes in white or Antique Bronze. It has a simple, smart diamond lattice table top design, and measures 200cm by 120cm. 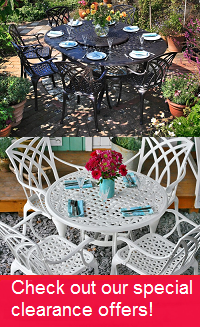 After you’ve chosen the right 6 seater garden table for your garden, choose which chairs to pair with it. A default chair will be available at no extra cost, but take a moment to consider others, such as the Emma, Rose or Kate chairs. You can pair one of these other styles of chair with your 10 seater table for between £5 and £25 per chair. These garden chairs are made of the same weatherproof and robust cast aluminium as the tables. Your 6 seater garden table and chairs will be much more enjoyable when enhanced with a few accessories such as seat cushions and a parasol. Underneath the section where you choose your chairs, you’ll find offers for seat cushions and parasols in various colours. Purchasing these accessories in combination with your garden furniture set allows you to save 70% on them, compared to buying them separately, so don’t miss out on this opportunity! Those aren’t the only available offers. You can also get between 20% and 80% off various aluminium patio furniture items such as bistro tables, benches or sun loungers. But these offers will be unique to this page, so combine them with your main order to take advantage. We have some outstanding deals on our clearance page, too. These standalone deals apply to everything, from side tables to 12 seaters. They change all the time, so check back regularly, and if you see a bargain on something you like, get it while you can! Delivery is free on all 6 seater metal garden furniture. So there’s no need to worry about extra charges on the checkout page. Our aluminium garden furniture sets are delivered as a large package or on a wooden pallet by our partner couriers Parcelforce or Geodis. Both offer online tracking of your order from the day of dispatch. Geodis will also call you the day before delivery to arrange a time slot that works for you. For details about delivery you can have a look at our delivery information page or give us a call. The friendly Lazy Susan team is available to take your calls or answer your emails from 08:00 to 18:00 daily. They can provide more information about our garden furniture and respond to any other questions you have. They can also send you fabric and metal samples. These give you an idea of our materials and help you select the colour which best suits your garden. Call us on 01243 717197 or email us at [email protected]. We try to answer emails within 2 hours during office hours.